Savage's crusade to rid Britain of the vicious Volgan invaders in the year 1999 began way back in Prog 1. All 116 pages of this latest Extreme Edition are given over to highlights of the Savage saga - from the Isle of Dogs to 'Doomsdale'; from the Scottish Highlands to the Liverpool docks - in episodes written by Pat Mills and Gerry Finley-Day and illustrated by Jesus Blasco, Mike Dorey, Carlos Pino and others. Also included is a preview of the all-new 'Savage' adventure - 'Taking Liberties', by Mills and Charles Adlard, begins in 2000 AD in April! 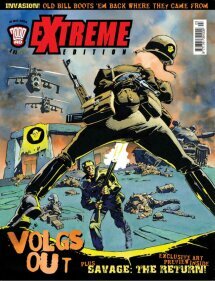 With a painted cover by fan favourite Cam Kennedy, Extreme 3 is available from all good newsagents and comic shops from 25 February 2004, price £2.99!